Live from CXC! Designer, editor and publisher Francoise Mouly joins the show to talk about 20+ years of New Yorker covers, launching TOON Books and cultivating a love for print, the pros and cons of going viral, the changing definitions of what’s offensive (and the time she got hauled into a meeting with an Arab Anti-Defamation League), the notion that comics are the gateway drug for reading, and more! (Sorry, no talk about her time with RAW magazine, since she and her husband, Art Spiegelman were interviewed about that later at the festival.) This episode is part of our Cartoon Crossroads Columbus series of live podcasts. Give it a listen! We also talk about Charlie Hebdo, the historical arc of gay marriage covers, the contrasts of her multimodal education in France with the American model, which comics she started her kids off with, how she deals with the moving target of diversity, the evolution of women in the comics scene, and why kids are a fantastic audience. Go listen! Françoise Mouly is the publisher and Editorial Director of TOON Books, which she launched in 2008. She joined The New Yorker as art editor in 1993. Ms. Mouly has been responsible for more than 1000 covers during her tenure at The New Yorker. The American Society of Magazine Editors (ASME) has chosen many of Ms. Mouly’s images as “best cover of the year.” In 2012, for the publication of “Les Dessous du New Yorker” by Editions de La Martinière, Galerie Martel in Paris presented “New Yorker Covers,” an exhibit of artwork by Mouly and seventeen other artists. 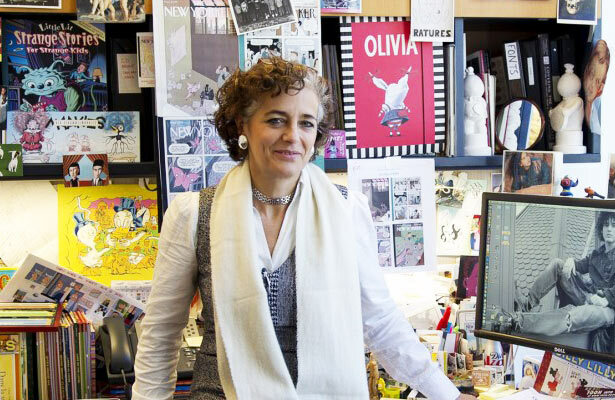 Starting in 1980, Ms. Mouly was the founder, publisher, designer and co-editor with her collaborator and husband, cartoonist Art Spiegelman, of the pioneering comics anthology RAW, where Spiegelman’s MAUS was first published. In 1998, after looking for material to help her two children become readers, Ms. Mouly established a RAW Junior division, to publish first the Little Lit collection of comics with HarperCollins, then The TOON Treasury of Classic Children’s Comics with Abrams, and launched the TOON Books imprint. Born in Paris, Françoise moved to New York in 1974. She was named Chevalier in the Order of Arts and Letters by the French Ministry of Culture and Communication. Among the many honors she has received are an honorary Doctorate from Pratt Institute, Gold and Silver medals as well as the Richard Gangel Art Director Award from the Society of Illustrators, and France’s highest honor, the Legion of Honour. She and her husband live in Manhattan. You can follow Francoise on Twitter at @francoisemouly and TOON Books at @TOONbooks. Credits: This episode’s music is Nothing’s Gonna Bring Me Down by David Baerwald, used with permission of the artist. The conversation was recorded at the Cultural Arts Center in Columbus, OH during Cartoon Crossroads Columbus in October 2015 on a pair of Blue enCORE 200 microphones feeding into a Zoom H5 digital recorder. I recorded the intro and outro on a Blue Yeti USB Microphone . Processing was done in Audacity and Logic Pro. Photo of me & Ms. Mouly by Amy Roth. Sad to say I can’t find a credit for the photo of Ms. Mouly at the top of the page.